Poland's lower house of parliament has approved controversial reforms which critics say would increase the ruling party's control over the judiciary. One bill allows politicians to choose members of the National Judiciary Council, which appoints judges. The governing Law and Justice Party (PiS) says the aim is to curb corruption and the influence of the former communist elite. But critics say the party is trying to cement its hold on power. The move looks set to increase tensions with the EU which earlier this year threatened Warsaw with legal action over the proposed reforms. The other bill approved on Friday lowers the retirement age for Supreme Court judges and would force out about 40% of those currently sitting. Both bills will now go to the Senate. Nils Muiznieks, Commissioner for Human Rights for the Council of Europe, a leading human rights watchdog, told the BBC that the changes would risk the independence of all aspects of Poland's judiciary. "The independence of the judiciary is being undermined here systematically," he said. "It began with the Constitutional Court and now it threatens to continue with the National Council of the Judiciary and the Supreme Court." 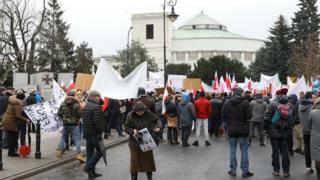 Thousands of Poles have taken to the streets in recent months in protest at the moves. In July, President Andrzej Duda vetoed a version of the bills. He will still have to give his approval if the legislation is passed by the Senate. Poland's incoming Prime Minister Mateusz Morawiecki, who replaced Beata Szydlo on Thursday, said on Friday he would continue with the reforms. "The programme that we have been pursuing will continue to be a guide-post for me to better serve the Polish public and Polish families," he said. On Thursday, the European Commission, the EU's executive arm, announced it would sue Poland, along with Hungary and the Czech Republic, for refusing mandatory quotas of asylum seekers.